Folks - a big sorry, that I haven't posted for such a long time. Well, I was busy, but also didn't fell that I could contribute anything interesting. As we are continuously working on Library bar [especially I am working on the "heads turning menu"], we had recently a tasting for their food. This just sparked some interest in finding the perfect bar bites. Bar food has different "angles": first an foremost it is additional revenue for the bar and additional service for the guests. With bar food you can also increase the average duration, the guests are staying in the bar - if they get hungry, they don't need to leave.. they can directly satisfy their cravings on site. It is also communicative and a different "culinary dimension" for the bar. I said it before: most bars, just don't find the right format and dishes. One dish, which I discovered, and which is perfectly suited for a bar is bitterballen. 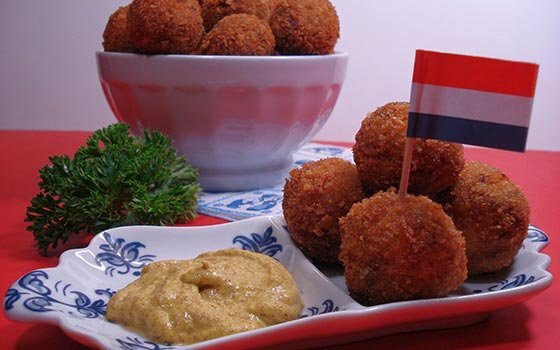 Bitterballen is a Dutch recipe. And you might suspect, that they are bitter - but they are called bitterballen, because they are the perfect snacks to consumer with....bitter liqueurs. We almost come a full cycle here, didn't we? Bitterballen are basically small balls of "pulled" beef [think ragout], in a heavy bechamel sauce / roux. First - you are cooking your beef... traditionally it is simmered in water [hence you have some stock later on, which you can use for the roux]. I however used a beef shank and sous-vide it on 80C for 10 hours. Then you flake up the beef. Next step is, to make a roux - use butter and fry some onions in it; add flour and roast the flour- add stock or milk or both, season and add the flaked beef - and season again to taste with salt, freshly cracked pepper and some grated nutmeg. Add also some finely minced parsley. Then you just have to chill it down - make balls out of the "paste" and bread it through flour, eggwash and bread crumbs [I am using panko]. After you deepfry the whole shebang, they are done... you can eat them hot, but they are also delicious cold - and I love them with mustard [I prefer spicy Russian mustard, which is a bit more robust but also "fruitier" than Dijon]. I think these nibbles are perfect for everyone but vegetarian [or "cow-non-eaters"]. And they are perfect to "soak up" one or the other cocktail, glass of beer or wine or shot of whiskey. I don't know one thing, which is better than those for a bar!